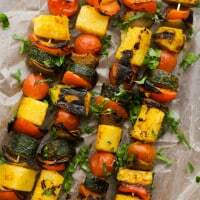 Curried Vegetable Polenta Kabobs | Naturally. If you follow along, you know that I have a slight obsession with grilled vegetable skewers, especially when they contain halloumi. Whenever we have cookouts, I almost always turn to skewers (it’s also an easy way to have vegetarian and meat options without making two separate meals). 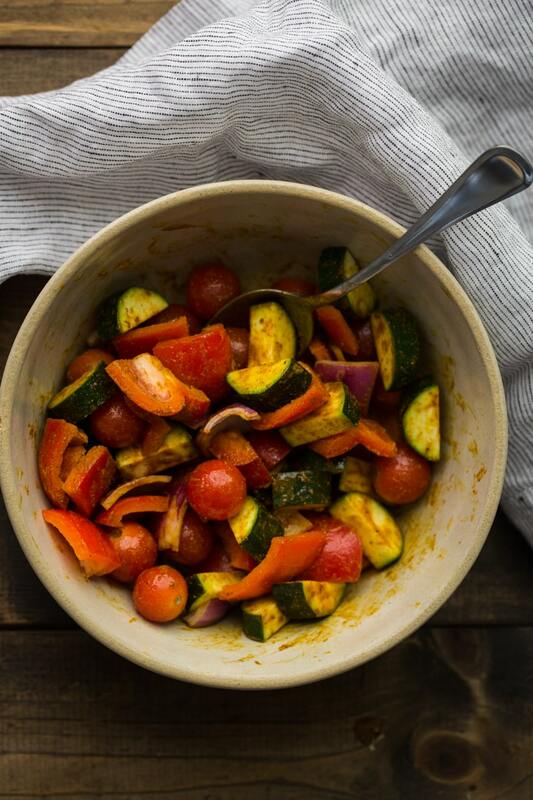 There’s just something about a big plate full of grilled vegetables that makes it feel more like summer. And on the plus side- using skewers helps keep all those vegetables from falling through the grate (let’s not talk about how many slices of onions I’ve lost to the grill over the years). Nevertheless, I understand that not everyone is as obsessed with halloumi as I may be or you might be looking for a great vegan grilling recipe for those summer cookouts. 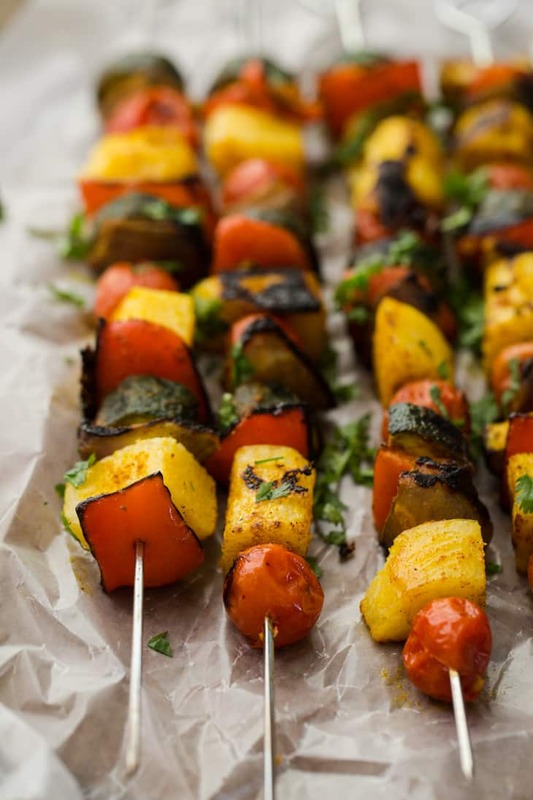 Enter my go-to: polenta kabobs. One of the great things about polenta is that once cooled after making, it’s easily sliceable and perfect for frying, roasting, and grilling. While I would typically make my own polenta, pre-made polenta from the store is not only quick but creates less hassle and dirty dishes (plus I think I’m incapable of making homemade polenta without adding a hefty amount of cheese and butter at the end- which negates the vegan point). 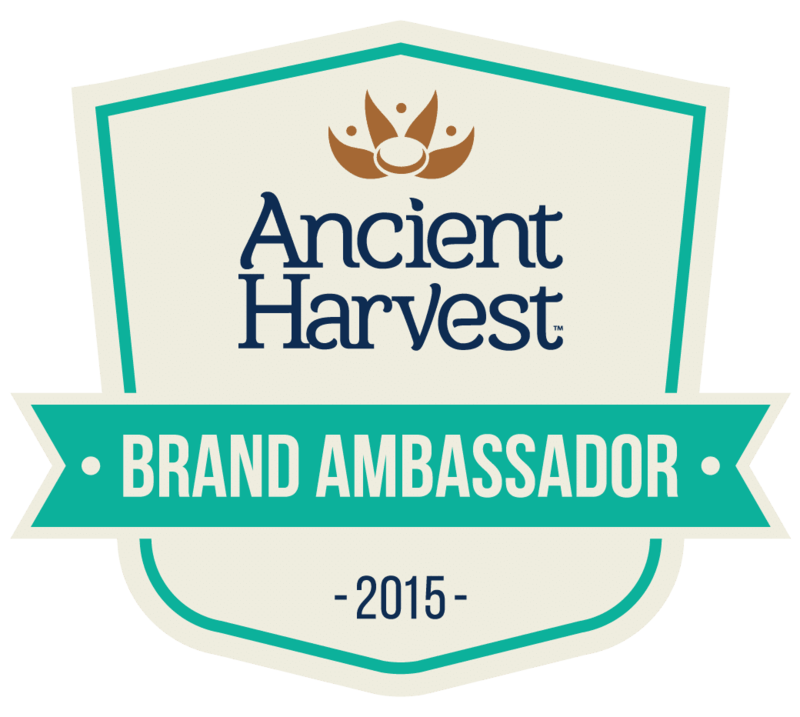 For these skewers I used Ancient Harvest’s traditional polenta which is gluten-free and vegan. 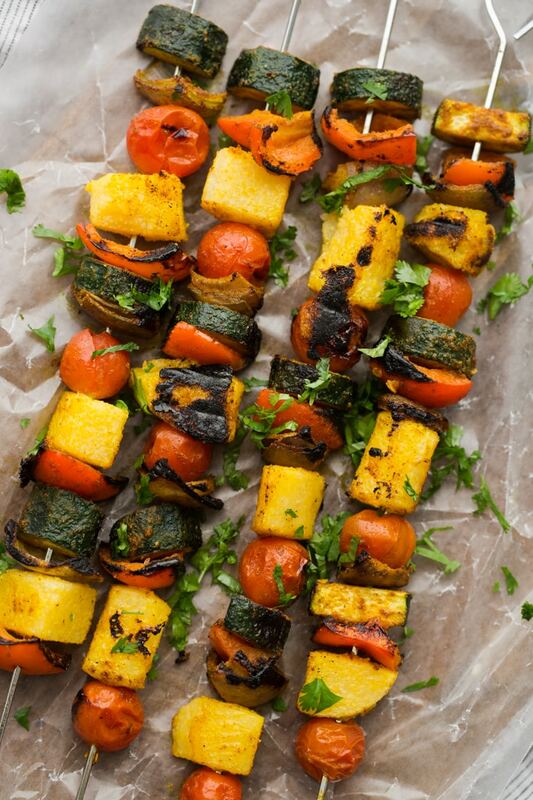 Combined with the mixture of curry vegetable-these skewers are sure to be a hit at your next cookout. And if you want to make it a full meal- whip up some grains and serve with a side of yogurt mixed with a bit of cilantro and limes. If using wood skewers, soak an hour before preparing. 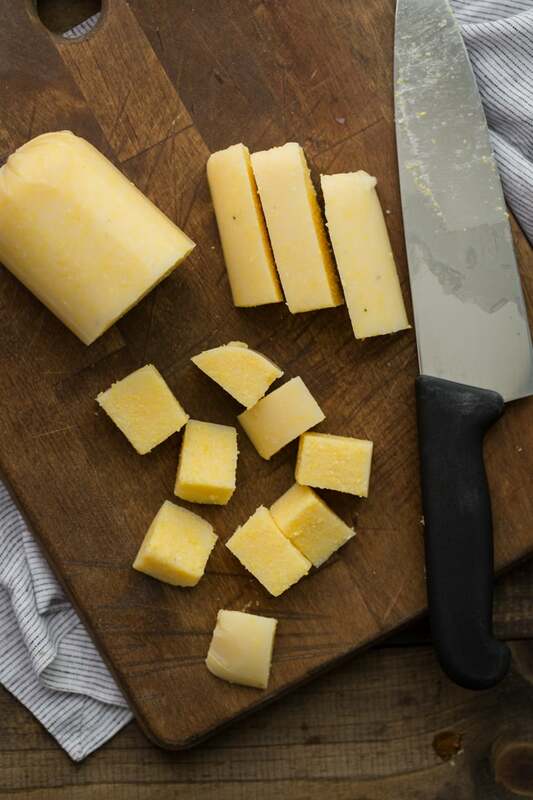 Cut polenta into rough, 1″ square cubes- you will want about 12 cubes. Set aside. Cut the zucchini in half lengthwise and cut eat side into 1/2″ half moons. Cut onions and peppers into roughly the same size pieces and place in a bowl with the cherry tomatoes. Add olive oil and curry powder, stirring until well combined. Light grill to a medium heat. Alternate threading the vegetables and polenta on the skewers until skewers are full. Brush any leftover curry mixture over the vegetables and polenta. 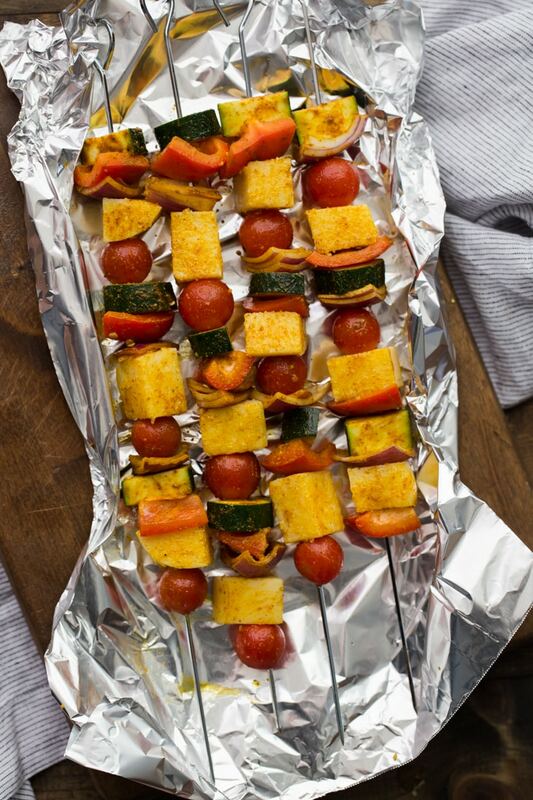 Place skewers on a well oiled grill pan or piece of foil and transfer to hot grill. Cook on each side for 2 to 3 minutes until vegetables and polenta are lightly charring. Serve with a sprinkle of cilantro and a side of limes and yogurt. What an interesting idea, wow. I have to try it! Love halloumi… but polenta is pretty great too 🙂 Love the look of this, and hope you and your babe are doing well! Huh, grilled polenta, never tried it but this looks great! I’m sure it would taste delicious with all those veggies! I’m always looking for an interesting new way to use polenta and grilling sounds great! I love the look of seared vegetables! No grill, would they work in the oven? I don’t want to miss out on deliciousness. I’m not sure about baking- I’ve never tried! Looks delicious and will be trying soon! Congratulations! Your son is beautiful! Enjoy! Polenta is the yummiest, crunncy or soft and creamy. This recipe looks fantastic! Hey, I love this! I love polenta but I always end up with so much left over, this is a great idea!